For many of us, it’s coffee, not liquor, that’s our “water of life.” I’m quite certain I could survive without alcohol. But I know I could never live without caffeine. I’ve tried really really hard to give it up, especially when I was diagnosed with a heart murmur and began to notice every jitter and flutter. I fell off that wagon so many times I have a permanent head bump. Inevitably I’ve given up giving up, rationalizing that I’m just a much better person on caffeine. But DC has a bit of a coffee culture problem. It’s hard for little independent cafes to survive (witness the deaths of Sparky’s, 14U, Mocha Hut, Mayorga, Murky Coffee…). Sometimes it seems we’ve given over to the Great Dairy Mermaid and her bitter rival the Loose Moose (wait, it’s the mermaid’s grinds that are really bitter, but I digress) that populate every corner plying milky sugary bastardized versions of the classics. I know, I know, you can’t give up your vanilla syrup. It’s ok. I’m not going to repeat my last rant about the decline of the perfect cappuccino. 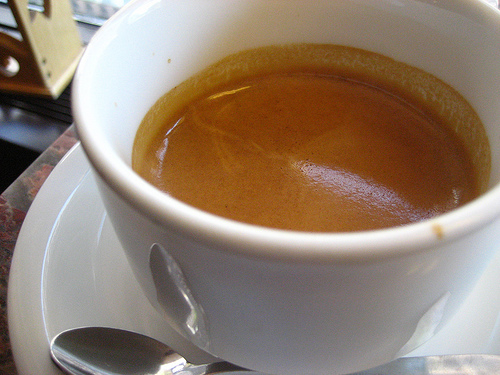 I’m not going to wax poetical about espresso in Venice or cafe au lait in Paris. Everybody has their particular coffee fixation – drip, press, etc. The uniting point is that there are some fine places to get your fix, ah, enjoy your coffee, here in DC, beyond the glut of mass market methadone. And with the news that Murky’s being reinvented in Chinatown, and a new coffeehouse called Mid-City Cafe will hit 14th Street, things could be looking up. So here’s a sampling of java joints to get your joy jitters on – and please leave your favorites in the comments. This unassuming little slice of a spot, manned by the best and friendliest family of baristas in town, is my go-to spot for morning cappuccino or mocha. Always the perfect balance between frothed milk and espresso, and their small is an actual 8 ounce serving, which is just the right size for my murmuring heart. I love how at mid-morning and mid-afternoon it becomes the spot for the Inter-American Development Bank crowd, snazzy dressers all gossiping over their coffee served in china. I have never had a bitter nasty tasting cup of caffeine poison here. The single espresso shot is pure nectar. They rock. Every barista in the city should go to “the Sip” and learn from the pros. It doesn’t get much closer to Italy than Ibrahim Selmy’s lovely import shop where in addition to fantastic coffee you can get all sorts of authentic goodies including quite the spread of antipasti and pastries to die for. But it’s his way with the perfect cup that keeps me coming back. Being as Ebo is both Sicilian and Egyptian, he knows how to craft the perfect cappuccino and his espresso will always have rich crema. There’s a sign in the shop that says it all – “Ebo’s Coffee is Nero Come La Notte, Forte Come un Peccato, Dolce Come L’amore, Caldo Come L’inferno”… sigh. One of the first pioneers around the Convention Center, Azeb Desta’s warmly painted cafe was voted Best New Shaw Business in 2005, its orange walls glowing as happily as your buzz. It continues to entice locals to hang out, enjoying free wi-fi and decent nosh, while being watched over by the very sweet Azi herself, who strives to make it a true neighborhood cafe. If you’re an Illy fan, get your fix here. If you like your coffee with a conscience, they are all over it at this Bloomingdale cafe, serving Counter Culture Coffee. They are heavily anti-artificial sweeteners, and pour drinks based on the classic sizes (espresso 3.5 ounces, cappuccino 6.5 ounces, etc) which may be precious to some but I think is rather endearing in this supersized world. Of course there’s still Soho Tea & Coffee in Dupont, which has that crunchy-granola-art-student feel, and Tryst in Adams Morgan, which has that checking-you-out-over-my-laptop-glare vibe (it also seems to still be the only coffeehouse open late). I’ll have to give First Cup Cafe a try, taking over for Breakwell’s in Shaw. And our own Acacia recommends Sidamo on H Street. So sound off on your favorite places. Maybe we don’t have a lack of coffee culture here after all! I second the love on both Azi’s & Big Bear! The baristas at Baked and Wired on TJ St in Georgetown are fantastic. Their espresso is fabulously Italian, dark and sweet, but not bitter. They also serve CounterCulture as their house blend – and you can buy it by the bag as well. I am also a huge fan of Peregrine Espresso down on Capitol Hill. Awesome drip and espresso coffees, as well as tasty sweets from local bakeries. wow, these are all new to me. thanks. I’ve never had the espresso there, but the beans at the Java House on Q St. NW at 17th are always nicely roasted. Lately I’ve been buying Mayorga beans at Sam’s Club, since a 2.5lb bag is around $15. That works out to about $.30 per 16-oz serving if I don’t share the bag with friends. The roast is also much more to my liking than the usual over-roasted swill at the chains, so it’s a win on both price and flavor. Peregrine Espresso really makes an art out of it too, complete with the cool patterns in the foam. They also do regular coffee pour-over style, brewing it while you watch for a nearly perfect cup of fresh coffee. The shop is much nicer now than Murky’s was, though seating is still EXTREMELY limited. Every chance I’m downtown, I seek out THE PERFECT cappuccino at Caffe (look for a huge red illy sign) – on the corner of New Hampshire and M Street NW (caddy-corner to Meiwah) near 22nd street. This little nugget of Italian caffeinated goodness is nicely priced, has a great patio or lots of cozy chairs/booths in the cool hotel lobby its attached to. My co-worker is addicted to these peanut-butter/marshmallow homemade chocolate bars they sell there, too. p.s. I second Peregrine at Eastern Market. Very cool staff and delicious cappuccino. You all are rocking my world with these recommendations. Agreed! The Caffe off of Washington Circle is probably my favorite. You can enjoy quality coffee outside or people watch in the lobby – and its an ideal location for Colonials. They have delicious snacks too. PS: Wanted to add good post! Others got to it before me, but I suppose I can just reiterate it– Peregrine Espresso is really top-notch. The place came off to me more as a coffee laboratory than anything else; when I ordered a “special concoction” of some kind, the barista called me over to have me watch him make the drink (one shot large!) with all of its infusions and who-knows-what. And of course, it was delicious. I was truly impressed by this place, and so close to Eastern Market too! Perfect for a Saturday morning out. You mentioned it briefly, but if you’re going to write an article about “coffee culture” in DC we’ve got to mention the fact the entire DC area doesn’t have even a single 24 hour coffee location. Its a crime. Aaron- tastee diner in bethesda. Aaron, I hear you, but I think that’s part of another issue too – the dearth of places in DC that are open 24 hours or late night for anything – not just coffee, but food and drinks as well. For coffee, it’s really limited to diners – Tastee (thanks Radman), The Diner, even 7-11 if you’re that desperate – if you NEED to be caffeinated to get through the night for whatever reason, it’s that kinda scene or your own home brew. The issue I think is that it’s already incredibly challenging for the independent shops to stay open and survive economically during regular hours, so how could they manage 24 hours? All sorts of other issues hit them as well besides making a living off it – safety too. Rappahannock Coffee in South Arlington – just down Columbia Pike from the Cinema ‘n’ Drafthouse – is good, too. I appreciate sharing the love for all the local indy coffee shops, but you forgot one of the(if not the very) best roaster in the city: M. E. Swing’s over at 19th and G St NW! I’ve fully enjoyed a few of their blends. I also wanna give a second shout out for Java House’s beans. Whats a cup of coffee without good beans? Crap. I’m going to take a look at local roasters over the next few weeks at my site. I dig the french press method, and have sort of given up on crappy chain-lattes for good.